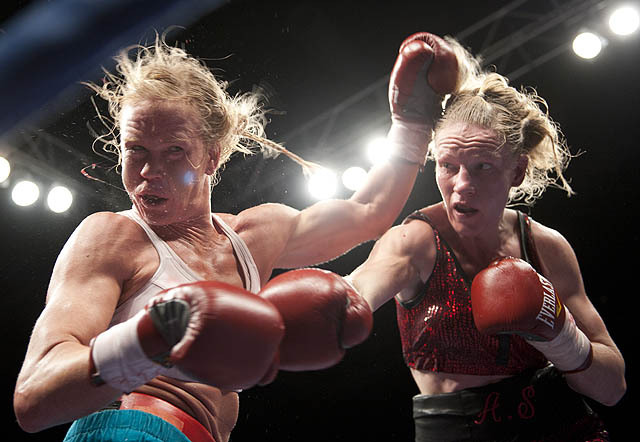 Much has been written about the oft described “stunning right” delivered by Anne-Sophie Mathis (26-1, 22 KOs) that KO’d Holly Holm (30-2-3, 9 KOs) at 1:39 in the seventh round of their International Boxing Association (IBA) and WBAN Welterweight title fight. Boxing writers dubbed Mathis’ victory the upset of the year, though many pointed to Mathis’ fifth round hit and subsequent 6th round shot that sent Holm down to the canvas as having clearly rocked Holm before she ever made it to the seventh round. Holm was knock into the ropes, but got up before the final straight right that put her back through the ropes and finally prompted the referee, Rocky Burke to stop the fight. Anne-Sophie Mathis who is a KO artist of the first order and proved that over and over again in her victory over Holm. What many have questioned is whether Holm was prepared for the onslaught in the run up to their December battle–but more importantly, have questioned why both the Ref and Holm’s corner let her continue after the 6th round when she was so clearly rocked and still wobbly in the early part of the 7th. 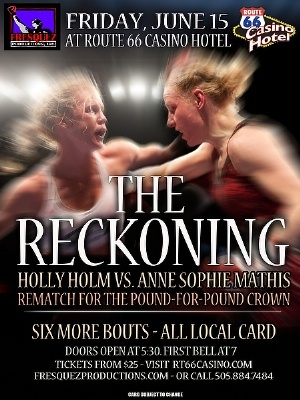 The two are set to meet again on June 15th in what is being billed as Holly Holm v. Anne-Sophie Mathis II — The Reckoning. The fight will be no doubt be a momentous battle and we will see for ourselves what the ensuing months have brought both fighters in terms of preparation and mental toughness as they go at it again. In what looks to be an attempt to forestall any controversy, the New Mexico Athletic Commission announced three well-respected and seasoned judges who will officiate at the bout. All three will come in from Las Vegas: Duane Ford, Dave Moretti and Lisa Giampi. Among them they have judged such world title bouts as Larry Holmes-Muhammed Ali and more recently Manny-Pacquaio-Juan Manuel Marquez II. Tom King of the New Mexico Athletic Commission stated, “They are among the most qualified officials in boxing,” when the announcement was made. The referee chosen for the bout is Jon Schorle who in his 20 years in the ring has refereed a total of 27 title fights. For further information on one of the most highly anticipated rematches in recent memory, click on www.FresquezProductions.com or www.rt66casino.com for ticket information.